In the past few weeks, I’ve been giving a lot of advice to speakers who were preparing their decks. Some of them were preparing for a conference. Others were preparing for workshops. And there were even those that were preparing for online courses. It was a lot of fun to do, and there were some great decks sent in. Of course, there were also quite a few things I could suggest for improvement. There is one thing that kept coming back when analysing the different slide decks: the text. A lot of speakers still put a lot of text on their slides. Because they want to share as much information as possible. This isn’t always the best approach though. Let me explain why. 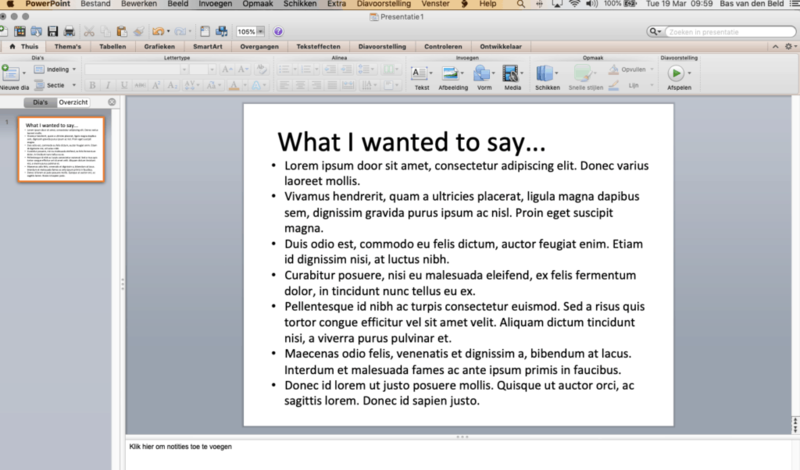 After that, I will explain how you can handle slides that do have text on them. Why is having too much text on a slide a bad thing? Before you go and change your behaviour… Of course, you want to know first, why is having too much text on a slide a bad thing? After all, you are trying to give your audience as much information as possible. Aren’t you helping them? As well as the intent often is, it isn’t helping them. For a lot of reasons. Have you ever been to a bar where they had TV’s hanging on the wall? You will have. And you will have experienced that it is hard to keep your eyes off the screen. Even though your conversation partner has something interesting to say. You can’t keep your eyes off it. The same thing happens with the screen(s) that are behind a speaker. People can’t take their eyes off it. At least, not until their brains have digested what is on the slide. So what happens to a person when they see a lot of text on a slide? They start reading what is on it. Because they need to digest it. That means their attention will stay on the slide until they’ve read it all. Now try this: have someone tell you something, while you are trying to read something for the first time. You will either fail to read or fail to listen. You can’t do both. The same will happen with your audience, they will focus on one thing. And that one thing is going to be the text. Their eyes will be drawn to the screen and will read, and won’t listen to you. I’m assuming that what you put on your slide is valuable information. Information that will help your audience. Your audience will feel the same way. It must be important because the speaker has put it on there! When people come to an event or when they are listening to a speech, they want to remember things. And to remember, they will write things down. This means that when you put text on a slide, chances are your audience will write down what’s on your screen. And you’ve guessed it. When they are writing, it’s hard to listen to you! Especially when you have quite a bit of information on your slide, it will be hard for people to keep track of what you are saying. Chances are they will still be writing when you click to the next slide. That will mean they won’t hear the first things you are saying on a new topic. The result is that people are playing catch up all through your presentation. They want to hear everything you say. They want to write down your message and your tips. But let’s put it bluntly: you’re not letting them. 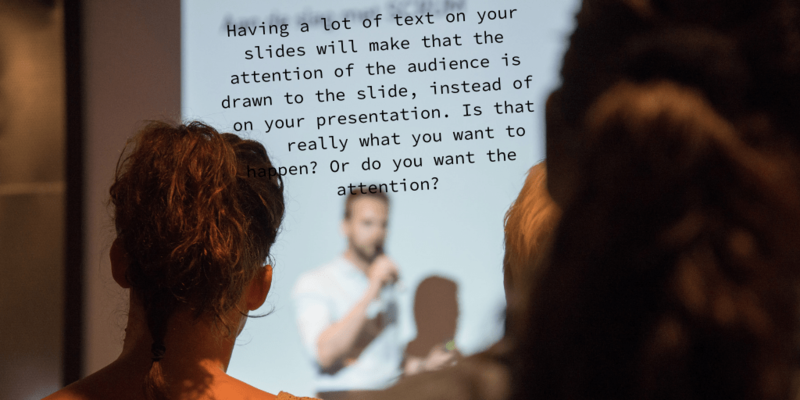 The more text you have on your slides, the more your audience is playing catch up with your words. And that’s not something you want happening! How much text can I put on a slide? The question now of course arises, is how to handle the issue of too much text on a slide. And how much text should be on a (Powerpoint) slide anyway? There are a few things that you can do. The simplest solution, of course, is not to put too much text on a slide. But the truth is that you sometimes do need text. Also, because you sometimes WANT people to write something down. Or to tweet something. The best way to do that is to use short bites. Short sentences that don’t take too much time to read or write down. How much? I use the rule of the ‘old tweet’. Meaning around 140 characters. That is enough to digest. It will also make that it will be easier for people to share your quotes, using your name in it as well. I don’t have much text on my slides. I use a lot of images. Using images prevents them from reading. I use images to represent what I am talking about. They support my words. They help my audience visualise my words. If you want a good place to find the right images, you can read the article I wrote about where to find high-quality images. If you do need to share more text, give them time to read. Pause your speech. Tell them they can read the slide if they want. Just don’t talk through it if you don’t have to. It’s common use to share slides afterwards with audiences. Even though there is discussion about whether or not this is a smart thing to do. Especially when you are using a lot of images, it won’t make much sense to those who haven’t seen your presentation. When you have a lot of text on your slides, it might be wise to share your slides. 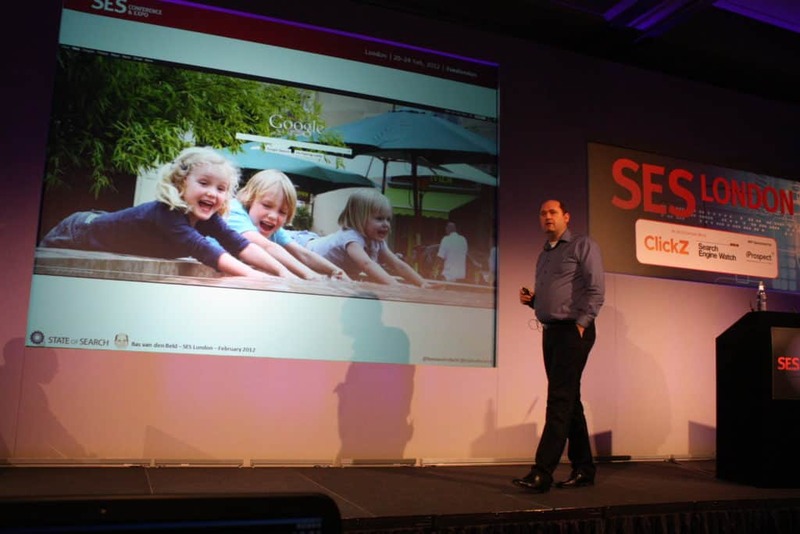 When you get to a slide with more text, tell your audience they will get that slide. Tell them they should write down some important words, but they don’t have to copy the entire slide. Powerpoint math: the 1-6-6 rule? No. Finally, there is the 1-6-6 rule. This rule is very simple. You should include no more than six words per line and no more than six bullet points per slide. They invented this rule to prevent people from using too much text. Unfortunately, it does the exact opposite. It encourages people to add text, a slide with six bullets and six words each, is still a lot of text! So when you think this rule is the way to go. Go up, and read the post again! When it comes to text on slides, there is no set number of words or characters you can or cannot use. The essence of it all, is to think about your audience. Understand them. And understand the attention curves. If you understand those, you can help your audience digest what they need to hear. Weekly steps to becoming a speaker with impact! Every week we send out FREE tips that will make you a better speaker with impact and trust. May we invite you to reserve your free tips?